Have you ever wondered why you always feel hungry at 11am even if you’ve just eaten breakfast? Or why you feel wide awake just as you’re supposed to be going to bed? 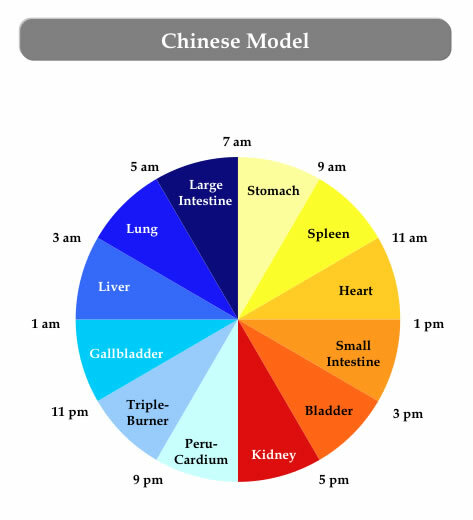 In Chinese medicine the body is thought to run according to a “clock” which shows when the energy of different organs (or channels of energy which are named after the organs) are prominent. This timetable can give a very good indication of what’s happening for you especially if it appears to happen at the same time every day. This is not a dissimilar concept to the idea of circadian rhythms – physiological and behavioural changes in the body that occur on roughly a 24 hour cycle, sometimes called the body clock. The image here shows the various organs of the body at specific times of the day/night. Some of them will be meaningless unless you understand the Chinese medical interpretation, but others make complete sense on an intuitive level. So, for example, Stomach time, is from 7am to 9am. This is when most people would usually eat breakfast and when the stomach energy is ready to receive food. However, in some people, where the stomach energy is not working very well, they can’t stand the idea of food until they get to work at about 9am and then they could eat a horse! Similarly, with sleep, normal sleep occurs when the balance of yin and yang are in harmony. Yin energy is quiet, resting, solid, peaceful, grounded energy. Whereas yang energy is active, moving, awake, lively, busy energy. Yang governs the process of awakening, whereas yin governs sleeping. If the two are out of balance (for example an emotional upset can cause the heart energy to be disrupted and not peaceful at night) this can cause insomnia. The heart energy should be at rest through the night and active during the day (11am – 1pm). If it becomes out of balance and cannot rest, you may find it difficult to sleep. Chinese medicine uses acupuncture and Chinese herbal medicine help re-balance you. Essentially this re-balancing of your energy is the whole purpose of Chinese medicine. If you need some help to return your sleep to a normal rhythm, call Stefan now on 0845 67 69 699 to book your session.